Saudi Arabia is te Best Place to Do Business? Is Someone High? So, I finally got hold of the October issue of Jordan Business and my funny bone was really, really ticked. The World Bank (which is apparently a bunch of old white guys) has ranked Saudi Arabia as the best place to do business in the entire Middle East North Africa Region. Does anyone besides me see the irony in this? But, perhaps those reforms are unnecessary to do business. After all, as a business woman in the Middle East, surely none of those would trouble me when doing business, right? So, maybe what they mean is that Saudi is the Best Place for MEN to do Business in the region? What's Wrong With Wal-Mart Moms? Recently a well-heeled family member proclaimed that they aren't Wal-Mart kind of people. Now, mind you, they have the cash in hand to not be Wal-Mart people. But then again, most days so do we. And yet, I am totally and unapologetically a Wal-Mart person. Any give day, you will see the Beans and I in 90% items from Wal-Mart. Living in Jordan has made me far more of a Wal-Mart mom than I was before. After buying items in Jordan that fall apart after 3 hand washings and cost twice as much as comparable good at Wal-Mart, I'm all for low prices and good quality. Prefer variety in types, sizes, etc. Sometimes Aren't the Errors More Likely? After all, isn't it more likely that an apartment with furniture is furnitured than furnished? And isn't it great that the owners of said apartment went to all the trouble to get the sign actually made with the wrong word? I personally vote to add this one to the dictionary... furnitured indeed! Where Exactly is THIS the tradition? So, El 3atal and I were with the Beans eating out when we came across this menu. The errors in the English menu are numerous, but hard to see with my none-too-steady cell-phone hand. But, this one was so funny to me. 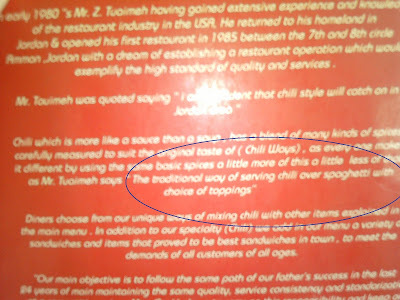 If you can read this (sorry for the poor photo quality), you'll see "The traditional way of serving chili over spaghetti with choice of toppings." So, again I ask, WHERE is it a tradition to put chili on spaghetti? Sauce, yes. Chili... not so much. In my home, the tradition is to put chili in a bowl and serve it with crackers. It is, after all, a hearty soup... Even on hot dogs or fries doesn't raise an eyebrow, but on spaghetti? I guess to each people their own traditions. Anyone Else Sick of the Swine Flu Panic? Now, don't get me wrong. Any case of the flu can be devastating. Being knocked out is a pain - literally. But, as I read the articles, I fail to find much to be alarmist about. The swine flu has had less fatalities than normal seasonal flu. 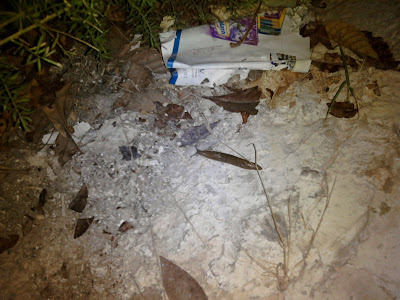 It's apparently really contagious (lots of people are getting it) and has caused fatalities in people seen as less likely with other flus (like teens and young adults), but overall it's been pretty mild from what I have been able to find. So, why is it that we are so gung ho to go crazy? I'm a weird mom. I know it (and I'm sure you do if you read the blog often). I worry about things like child abduction (almost unheard of here), but can't get excited at the flu. And, we've recently had a brush with it. JujuBean's school just finished a week off due to swine flu cases. And several were in her room. On her last day before the impromptu vacation, half her class was absent with cold or flu-like symptoms. The teachers let me know when I picked her up, likely fearing I would go a bit over the edge. I just rather laughed it off and asked them to let me know if there would be school or not. Quarantine: JujuBean continued to play with the other Beans, sleep in the same bedroom, take her meals with them. Better that they should all get it than that she should feel like she's done something wrong. Worry: Much to TetaBean's chagrin, I only called to pediatrician the 2nd afternoon to make her feel better. The Ped confirmed my approach and we all went on with life. I find that worrying is likely only to make me sick, not get her better quicker. Search out every alarmist site on the net: I'm sure there are thousands of sites on the Internet dedicated to how scary swine flu is, I chose to simply check the medical ones and confirm my treatment jibes with the best known approach and went on. Have a Swine Flu party: Okay, this is a trend in the US that I think is silly and dangerous. It's one thing that my kid may or may not have it, it's another thing to knowingly TRY to make other people sick. That's what that is - sick. Take JujuBean around the world: Poor JujuBean was stuck at home for a number of days. She missed ballet practice and a fun school event. She was sad, but better not to spread the illness (whatever it was) by taking her out too soon. Bottom line, it seems like I get an alarmist e-mail every day for or against swine flu vaccines and such. For the Beans, we won't be even considering them. I would never give my kids a vaccine that is untested on humans. And, I'm not huge on flu vaccines generally, so we'll be skipping those too. So, if you're sending MommaBean a message these days, please pick a topic other than swine flu. I, for one, am just plain fed up with the topic. Snips and Snails and Puppy Dog Tails? One side effect of having improved our garden this year is that during the summer we spent alot more time outside. We invited friends over and had the kids play on the tile, we had the older Beans over and had dinner on the new patio. Basically, we spent more outside time than we have pretty much ever. 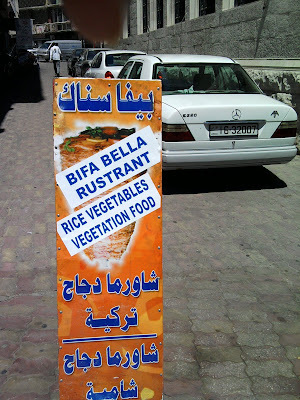 So, I guess it should be no surprise that I saw things I haven't really seen before in Jordan. Like slugs. Did you know they have slugs in Jordan? They don't exactly have a name for them (they call the snails without the shell, teehee, I LOVE that). But, they have them. Don't believe me? Well take a look of this picture that I grabbed. to watch them shrivel up. It seems so cruel to me now that I just couldn't encourage the Beans to do such a thing. One thing that amazed me about these slugs is tat they are HUGE. I mean, these must be twice the size of our nice little slugs back home. They're gross and disgusting, and really really cool. Anyone else seen lots of slugs this year or are they all hanging about in my garden? We were out and about and I managed to grab this snap shot of a restaurant sign board (and yes, they always wonder what in the world I'm doing...). I particularly enjoyed the inventiveness of the misspellings on this one. Now, I grew up in a place where climate change has a very different (and less personal) meaning than here in Jordan. In Jordan, most of the country is arid (desert) with a few patches of semi-arid (almost desert) mixed in for good measure. Seeing running water in nature is remarkable. My home state, Alabama, has lakes, ponds, creeks, streams, and rivers in abundance. I mean, look at all of the words we have just for a running body of water. The different between a creek, stream, and river is all about relative size. When Alabama has a drought, it means that the rainfall is significantly less than usual... but that significantly less is significantly more than a banner year for Jordan. In Alabama, we get on average 60 inches of rain a year spread evenly across the seasons. In Jordan, I'd be surprised if we get 1/4 of that and it only rains in the fall/winter - mostly winter. As a result, Jordan is browner than green and the trees and plants are very hardy. So, when the temperatures rise and rainfall patterns change, Jordan feels it acutely very quickly. Water sources are scarce and those that exist can be troublesome (remember that news item that caused so much controversy about the Disi Aquifer water project?). For this reason, Jordan needs to be finding its voice, actively leading conversations about the environment and man's impact on the global climate. After all, thinking that those things that impact one nation don't worry us is impractical on this issue. If the climate changes in one nation, impacts can be felt around the world. We don't want other deciding for us, do we? And, for those who think that climate change isn't happening, excellent, now demonstrate that using the actual numbers in Jordan. I don't mind if you want to lead the conversation that way, just step up and lead. Scientists of Jordan take note, we're looking to you to be open and honest about the impacts of global decisions, including climate change on Jordan. For more information on Blog Action Day, check them out here. I was reading this article in the NY Times on-line about kids walking to school. It got me thinking about the world that is so different for kids today than the one I grew up in. To be clear, this isn't a Jordan vs. US post. This is a US in the 70s vs. the US now post. The bus stop debate is apparently another area for parents to feel bad about themselves. After the much publicized stranger abductions of kids walking home from school, parents have become more and more frightened of letting their kids out of their sight. I don't blame them. I'm a Mom. According to some an overprotective Mom. I shudder at the little 4 year olds who walk to the school across from ButterBean's all alone. I fear for their lives on a practical level, not even and abduction-potential one. But, I also get the desire to build Independence. That's why some see me as overprotective... in KG 1 and 2, I walked ButterBean to her classroom. Not because I wanted to, but because she needed me to. Nowadays, the TwinBeans' classrooms are on the second floor and I wave goodbye at the front door. They just need less hand-holding - literally. But, in the US, the hyper-fear of abduction (only about 115 a year by stangers as compared to 250,000 injured in car accidents...) is leading to more hand-holding rather than less. That's my short list of independence-related things. More to add? Drop me a comment. Good customer service while shopping for make-up! Go Faces! Well, I had to let all of you ladies who, like me, wear big name make-up brands that there is a place to shop that has good customer service! Those of you (all 3 of you) who have read my blog for a long time have certainly heard about my challenges buying Clinique make-up. The original place I tried on Mecca Street is rarely open. When they were, the young lady tried to tell me that Clinique had stopped making my shade of make-up because they don't carry it in Jordan. So, I resolved myself to simply buying make-up in the US and shop-and-shipping it or having friends bring it. The next time I needed a Clinique product (City Block Sunscreen, which is an awesome product), I tried the Clinique counter in Baraka Mall. They were open but the service was rather lackluster and they didn't have what I needed either (again tending toward dark shades). So, yesterday, after having just been mentioning that my blush, eye shadow, and lipstick were in pitiful shape (my blush is in 20 pieces and only crumbs, my eyeshadow has a hole in the center so large I have to scrape the barrel to get any, and my 2 lipsticks are down below the rim of the tube...), I saw a store in Mecca Mall that sells Clinique. Faces ME, which I don't think was there the last time I went by that location, has Clinique, Lancome, Dior, etc. Basically, they seem to have upscale make-up and perfumes. I was quite happy. And, while the sales girl didn't speak English, her colleague who sells Dior did. So, between the three of us, we got me new lipstick, blush, and eyeshadow. It was rather comedy of errors since every shade on the display I liked they didn't have in the back. In the end, we ended up with them pulling their stock from the back and opening it to see what the shades look like. Both sales girls were friendly and helpful. And, while we were checking out, El 3atal mentioned to the gentleman that they don't seem to carry my shade of foundation and asked if they can order it. He indicated that they would be happy to and took my name, number, and shade. We'll see if they come through. One thing I do think they could learn from the American branches is the makeover. For those who don't know, 2-4 times per year Clinique introduces new color schemes. In the US, they launch these with make-overs. They send cards by mail announcing the new line and asking their customers to call and schedule a free makeover. I'm the sort that only buys make-up every 2 years or so, but when I do, I buy everything. If I try on a set of make-up I like, I'll buy it all, down to the lip liner, eyeliner, and mascara. I spend a couple of hundred dollars at a go. So, basically, I'm the ideal makeover candidate. I come, see, like, and buy. The other nice thing they do is start a card of all of the products you've bought from that Clinique counter. That way if I liked something I had, bu don't remember the name, they can tell me so I can get it again or can find a similar shade. So, those would be my recommendations. However, regardless of things they could do to boost business, they are on the right track with good customer service. If you need upscale make-up, I definitely recommend giving Faces in Mecca Mall a try (they're in the extension on maybe the 2nd floor next to the parking garage). I was very pleased with the service I got and they will be meeting my Clinique needs from now on (especially if they can actually order products for me!). jumped in puddles! I got the idea from ButterBean's English teacher. Not only is she a great teacher, but she's personally a delight! She was teasing her daughter about the rain and said that it wouldn't rain hard enough to jump in puddles. And, with His usual sense of humor, God proved her wrong. I was a bit concerned when the rain was coming fast and furious since I didn't bring my umbrella in to the school. I finished my class, realized I forgot my gym clothes at home and so determined I would sit on a nice bench in a wee courtyard at the school and listen to some Tony Campolo. Today's discussion was on Christianity and money (how we should use it, what is a tithe and is it applicable and such). As I was enjoying myself immensely, I felt a rain drop. Then two, which I ignored. But, when I felt ten, I decided to go inside. Shortly after I did, the bottom fell out. I was getting wet INSIDE haha! Something about open windows in the second floor balcony. At any rate, by the time the Beans had finished their activities, the rain had stopped. I thought about it and decided that there is no better time than the present to hop in rain puddles. It's one of those childhood experiences that I took for granted before moving to Jordan. In Alabama, it rains year round and summer rains are usually warm. So, puddle jumping is a given along with hot nights chasing fireflies and swimming like a fish by the time you're 6. In Jordan, not so much on all those counts. So I decided to buck the trend and jump in puddles today. The Beans had a good time doing it, too. But, don't tell anyone, because I can imagine the lectures that I'd have gotten if anyone (other than crazy Ajnabeeyeen like us) had seen us doing it. No doubt jumping in puddles causes colds, or swine flu, or something like that, right? Teehee. So, TetaBean, if you're reading, forget I said we did this. And others, feel free to live vicariously through us and our puddle jumping. We had great squealing fun and wish you the same opportunity someday soon! Today the Jordan Times has an article on Gaza's continuing downward trend. The number of Gazans living in "abject poverty" has tripled to 300,000 this year. My heart goes out to those children living in poverty. Those who feel the pangs of hunger in their bellies. My heart goes out to the fathers, unable to provide for their families, marginalized as men by that evil, soul stealer. My heart goes out to the mothers. My mommy's heart goes out the most to the mothers tonight. The knowledge that all of their love can't create food, shelter, clothing. The aching worry that winter is coming and their children will be left cold and hungry. The nagging heart-pain of wanting to ease their children's cries and knowing thy are helpless, powerless. My heart is in Gaza tonight. My prayers are on Gaza tonight. May the Creator and Author of all things have mercy on the people of Gaza tonight. May He find a way through war to peace. May He work miracles for the people of Palestine. And may He help them know that our prayers are with them. With Muslims, Christians, people of all religions, backgrounds, all people. Again tonight, I am with you in spirit and prayer, people of Gaza. And God is with you. As Dylan Thomas so wonderfully said it "Do not go gentle into that good night", people of Gaza. "Rage, rage against the dying of the light."